Things have been so crazy the past year that I have not been baking much other than bread, so on the rare occasions when I have baked I have tended to rely on old favorites with which I am comfortable and can whip out in a short amount of time. However, I was invited to a birthday party and one of the two birthday celebrants was the woman who usually brings one of the cakes (yes, cakes - we take dessert very seriously) to our celebrations, so I volunteered to make one of the cakes this time. Her cakes are always quite extraordinary, so I wanted to find a recipe that would do her justice. It did not take me long to settle on this nutmeg cake, as I had been eyeing the recipe for a while and deeply regretted that I had missed the opportunity to make it for my spice group's nutmeg potluck. While nutmeg is used to enhance many dishes, most recipes call for just a pinch. This nutmeg cake uses four and a half teaspoons, which is one teaspoon more than a tablespoon. That is a lot of nutmeg, let me tell you. But not too much. The sour cream balances out the flavor and gives the cake a rich, moist texture. The original recipe just has a stenciled powdered-sugar design on the top but I wanted something a little fancier for the occasion but I did not want to overpower the more subtle tones of the nutmeg, which I was afraid would be the case with frosting. 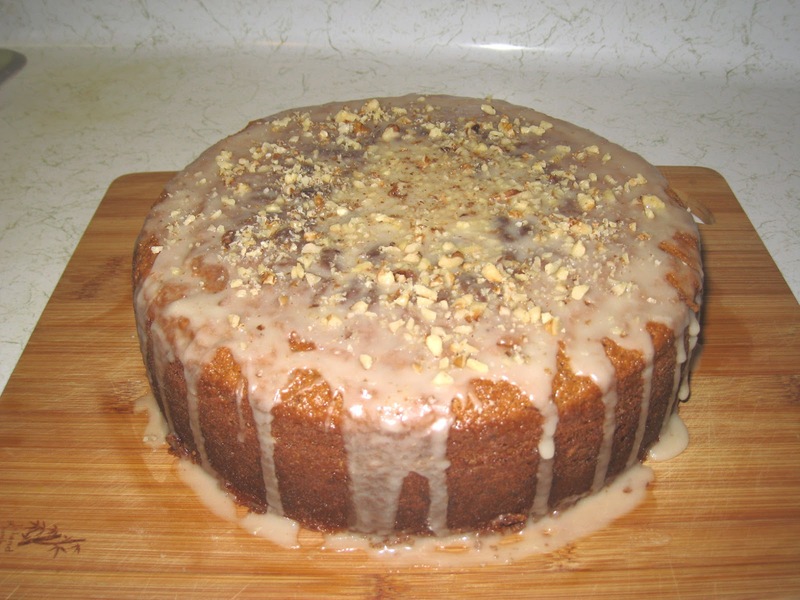 I thought a simple glaze would hit just the right note, and from there it was an easy step to add cognac and garnish with chopped walnuts to mirror the walnuts in the cake. The end result was beautiful and delicious. The cake was moist and rich and the glaze was the perfect topping for it. If you are looking for something different from the usual repertoire of cakes this one does the trick and is much easier to make than the end result would indicate, if you are looking to impress. But the taste alone will accomplish that. The one thing upon which I will insist is that you buy your nutmeg whole and grate it yourself. There is no comparison in flavor between buying it already ground and grinding your own. And no excuse for not doing so either, if you ask me. Heat oven to 350°. Butter and flour a 10-inch springform pan and set aside. In a food processor combine flour, nutmeg, baking powder, cinnamon, baking soda, and salt. Pulse to combine. Add butter and pulse until pea-size crumbs form. Add brown sugar, sour cream, milk, and eggs and process until smooth. Add the walnuts and stir them into the batter. Pour the batter into the springform pan and smooth the top. Bake until a toothpick inserted into the center of the cake comes out clean, 45 to 50 minutes. Transfer to a rack and cool. Combine the sugar, water and cognac and mix well. Add more sugar or water as needed to reach the desired consistency, which should be thick but should run smoothly from a spoon. Drizzle the glaze over the cake and top with the chopped walnuts while the glaze is still warm. Mmm, looks amazing! I want to try that sometime. And yes, that is a lot of nutmeg. Hence, eaters should remain aware that a toxic dose of nutmeg is considered 2-3 t. (http://nutritionfacts.org/2013/10/31/nutmeg-toxicity/), so don't eat half the cake at a sitting! You know, there was something about that niggling around the back of my mind when I was writing this post, Eve. I knew nutmeg had hallucinogenic potential but I thought it required a much larger amount to achieve that effect.